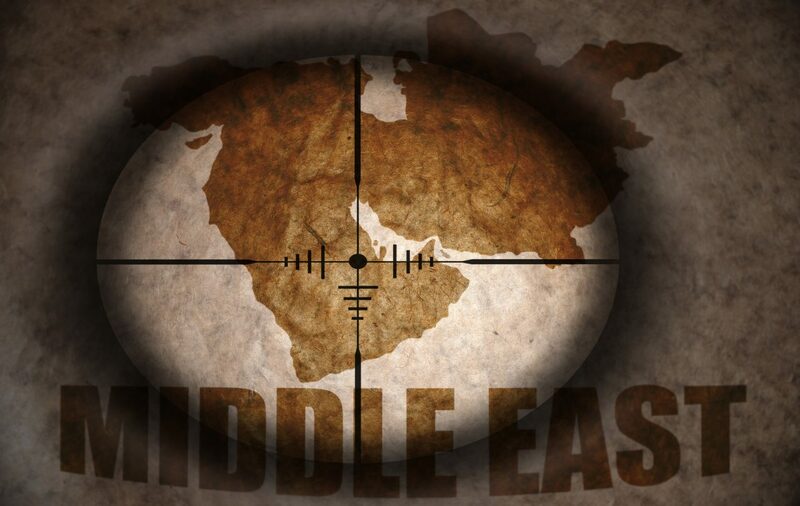 Founded in 2017, the Middle East Politics Journal publishes quality and in-depth articles and analysis on current issues within the Middle East region. The journal welcomes opinion articles, evidence-based empirical studies and case studies with the focus on political subjects in the Middle East. ME Politics is committed to presenting new perspectives on pressing problems, addressing complex issues with insightful analysis, and exploring emerging trends shaping the region. For the past three years, Turkish President Recep Tayyip Erdogan has taken his nation on a seemingly endless political roller-coaster ride. Under the auspices of his government, the country has seen two parliamentary elections and a controversial referendum that vested wider powers in Turkey’s presidency. Meanwhile, the purges he commenced after a failed coup attempt in 2016 are still roiling the country. The next big event comes June 24, when Turks will vote for their next president and parliament. For Erdogan and his opponents, the stakes are as high as ever. If he wins, Erdogan will assume the Turkish presidency’s expanded executive powers, granted by the bitterly fought referendum in 2017. After a decade and a half in power, Erdogan has become the most consequential Turkish politician since Mustafa Kemal Ataturk, the founder of modern Turkey. But his critics fear the death of Turkey’s enfeebled democracy and the strengthening of an overt authoritarian. A growing body of analysts cast Turkey under Erdogan as a prime example of how democracies can backslide and how ostensibly liberal politics can give way to toxic majoritarianism. Erdogan is a canny political operator, and he has preserved his rule by mobilizing a divisive yet effective brand of religious nationalism. He has trained his ire on a vast web of supposed enemies abroad, from obstreperous Western governments to a Kurdish separatist terrorist group to a geriatric cleric living in exile in Pennsylvania. But although he once could campaign on a track record of economic prosperity and development, the Turkish economy is teetering dramatically. Erdogan’s challengers are stronger this year, thanks both to the political winds and the emergence of an opposition alliance that includes not only leftists, religious minorities and secularists but also right-wing nationalists and pious Muslims. Erdogan’s main opponent in the presidential race is Muharrem Ince of the Republican People’s Party, a centrist party once associated with decades of stifling secularism as well as the repression of ethnic minorities carried out by the Turkish state. Ince, a former schoolteacher, has worked assiduously to dispel this image and champion a more inclusive future. As in elections in 2015, all eyes are on the Kurdish vote. Kurds represent about 20 percent of the country’s population; Erdogan, who moved to liberalize restrictions on Kurdish cultural rights, once drew tremendous backing from religiously-minded Kurdish voters. But the resumption of conflict with Kurdish militant groups in Turkey, Syria and Iraq has weakened that support, as has his government’s persecution of the Peoples’ Democratic Party, or HDP, a left-wing, pro-Kurdish party that Ankara accuses of collusion with outlawed Kurdish militants. If the HDP can win more than 10 percent of the national vote required to gain seats in Turkey’s parliament — as it did in June 2015 — Erdogan’s AKP will struggle to win a majority. The HDP’s charismatic leader, Selahattin Demirtas, has been thrown in jail on terrorism-related charges he and his supporters flatly reject. He is running for president behind bars. Erdoğan is running for president, of course, but who else is in the running for control? The country will hold presidential and parliamentary elections on 24 June. If no candidate wins an outright majority in the first round of the presidential elections, a second round will be held on 8 July between the top two candidates in the race. Why are the elections being held now? The elections were supposed to be in November 2019. President Recep Tayyip Erdoğan, however, called for early elections back in April. He said that Turkey needed to “overcome uncertainty” at a troubled time in the region, amid its ongoing military operations in Syria and Iraq. Critics, however, say the race was brought forward because Turkey’s currency and economy are suffering and the president wanted to preempt the downward trend. He may also be hoping to capitalise on nationalist sentiment after military victory in Syria, where rebels backed by Turkey defeated Kurdish militias near the border in a region called Afrin. This is arguably the most important election in Turkey’s modern history. The new president will assume an office imbued with sweeping executive powers that voters narrowly approved in a constitutional referendum last year. These include the power to issue decrees with the force of law, appoint the cabinet and vice-presidents as well as senior judges. If he wins, Erdoğan will continue to shape Turkey and its society for years to come. Erdoğan, of course. He remains the most popular political leader in Turkey. But he faces several important opponents who have done unexpectedly well so far in the campaign, and, as a result, a second-round contest is now the most likely outcome. There is Muharrem İnce, a charismatic physics teacher who is the candidate of the main opposition group, the Republican People’s party (CHP), and Meral Akşener, nicknamed the ‘she-wolf’. She is the leader of the new nationalist Iyi (Good) party and is popular with both youth and working-class Turks. Temel Karamollaoğlu, the leader of the Islamist Felicity party, is also running, and has emerged as a key critic of Erdoğan even though their parties share ideological roots. Selahattin Demirtaş, a charismatic politician once dubbed the ‘Kurdish Obama’ and who leads the leftist and Kurdish issue-oriented People’s Democratic party (HDP), is running for the presidency from his prison cell in the city of Edirne. He awaits trial on terrorism charges. There are two main coalitions running for parliament. The first includes the ruling Justice and Development party (AKP) of Erdoğan, which are in a coalition with the nationalists. On the opposite side is an alliance that includes the secularists of the CHP, the breakaway nationalists of the Iyi party, and the Islamists of the Felicity party. They make strange bedfellows in a political system where secularists and Islamists have traditionally been bitter enemies, but such is the importance of these elections that former rivals have banded together to oust the president and his entourage. The HDP is running by itself. The Turkish constitution requires that parties obtain at least 10% of the national vote to enter parliament, a law that favours larger parties. A new bill recently allowed the formation of election alliances like those described above, which will allow smaller parties like Felicity to win some seats in the legislature if their alliance as a whole crosses the 10% threshold. If the opposition alliance performs as expected, and the HDP gets over 10% of the popular vote, the ruling AKP could lose its majority in parliament. Erdoğan was hoping to catch his opponents by surprise when he called for a vote, but attendance at ruling party rallies has been lacklustre, and the Turkish leader does not appear to be at the top of his game. The economy has also caused headaches, with the Turkish lira falling in value against the dollar, concerns mounting over the long-term health of the economy, and fears over the Central Bank’s independence. Still, Erdoğan is the most popular Turkish politician, and is likely to win the presidential race. Polls are notoriously unreliable in Turkey, but for now it looks like he will easily win the first round, but without an outright majority. A second-round race against Ince or Aksener still favours the president, but is increasingly looking too close to call. It will depend on whether the opposition can draw away conservative and nationalist voters, as well as Kurdish voters angry about Erdogan’s alliance with the nationalists. Also, there is a very real possibility that Erdoğan will win the presidency but lose parliament to the opposition, which has promised to roll back the constitutional amendments passed last year. But, under those same amendments, the president can dissolve parliament, and the legislature can call new presidential elections in response. According to some ruling party officials, that’s exactly what Erdoğan might do, which would give his party a chance at a do-over, but plunge Turkey into uncertainty. In an attempt to secure the country’s democratic transition and to avoid being trapped in the critical zone, Mr.Erdogan accepted moving the planned elections of 2019 forward by more than a year. However, the devil was wearing an election tag, and the economic situation deteriorated dramatically. The Turkish Lira hit its lowest point in eight years, recording 4.39 against the Dollar and resulting in a 13% loss. Speculations about the ability of the central bank and the government to manage the crisis have been discussed in regional and global media on a daily basis. The talk about the economic voting in the forthcoming elections on the 24 June occupies all the news headlines. The conventional wisdom will be that we are facing an economic tragedy moving at a rocket speed heading towards its target on the election day to hit Erdogan. Nevertheless, looking behind the charts, and digging deep in the story, several questions remain unanswered. Are we witnessing a natural economic disaster that follows the rule that success breeds active inertia and active inertia breeds failure? Or are we watching another planned orchestrated crisis designed to remove President Erdogan via reinventing the 2016 failing coup attempt in a new economic vehicle? To answer these questions, we should explore the Turkish case in the context of its geopolitical relations, its role in the region, economic rivals, the nature of ties and diplomatic relations with major players in the region. Economic collapse is not a product of a few weeks and not in the case of the strong Turkish economy. The ongoing tension with other regimes in the region, in addition to the forecasted conflict of interest, offers a better explanation of the foggy picture. I argue that Turkey represents the only remaining form of the democratic transition state in the region. In Egypt, a similar orchestrated economic crisis involved a fuel shortage story and faked inflation among other tools, which were used to remove the first freely elected President in 2013 via a military coup led by field-marshal Abdelfattah AlSisi, the current Egyptian President. Not surprisingly, UAE, Israel and Saudi Arabia (the same group in the Turkish case) were the main supporters of the Egyptian coup. Injected billions of dollars in the Egyptian economy, they attempted to support the Sisi regime after the successful coup. The two Gulf states saw the new-born democratic Egypt as a direct threat to their Monarchies. Israel considered the rise of the Muslim Brotherhood in Egypt as a critical threat being unable to maintain control over the elected government. In contrast, Erdogan had close ties with Morsi, stands firmly against the coup and hosts thousands of Egyptian opposition groups and members of the former government. On June 5, 2017, the same invisible hand decided to cut ties and blockaded Qatar based on acquisitions that Qatar was supporting the free press, Egyptian opposition, and Hamas. President Erdgoan has been a major supporter of Doha on this front and all acquisitions were rejected by the international community. In the same context, the tension between Ankara and Israel goes back to the Davos incident in 2009, when Erdogan stormed out of a World Economic Forum debate following a clash with the Israeli president over Israel’s offensive against Gaza. Bilateral relations deteriorated when Israeli naval commandos intercepted the Turkish ship Marmara en route to breach the Israeli blockade of Gaza. That incident led to the deaths of eight Turks and one Turkish-American. Recently, the picture turned black because Erdogan is the only leader in the region who clearly stood against the announcement of Jerusalem as the official capital of Israel, expelled the Israeli ambassador from Ankara and calling Israel a terrorist state over the killing of civilians in Gaza. In recent years, the charismatic president has become a symbolic leader across the Arabic and Islamic world; he has even been called Sultan Erdogan among people in the Arabic and Islamic streets. Turkish cinema is significant in magnifying this leadership role and has brought the legacy of the Ottoman Empire to the hearts and minds of hundreds of millions of people around the world. The leaders of the invisible hand’s group lack this Erdoganian-charismatic style and consider it a real threat to their crowns and regimes. Furthermore, Erdogan’s futuristic vision of Turkey in 2023 following the end of the Lausanne treaty, controlling the channel linking between the two seas Black and Marmara and beginning oil exploration and drilling, is another nightmare for the invisible hand’s group and some countries in the west. In the view of the above, there are no doubts that Erdogan’s vision and philosophy represent a significant threat to the invisible hand’s group in addition to some western countries on both the political and economic fronts. It is my argument that these countries will endeavour to reinvent a new economic coup on the way to the June 24 elections, as confirmed by the Turkish Prime Minister in his recent TV interview. However, the answer to the futuristic question about where Turkey is heading remains in the hands of the Turkish people who will vote for their next president soon. The choice is whether to continue Erdogan’s remarkable economic and power journey heading toward 2023 or to fall into the trap of manipulated politics, political instability, regional and global influence, in the best-case scenario landing on a toxic economic zone similar to the one of Egypt. “في 11 أيار/مايو، خاطب پاتريك كلاوسون، كاثرين باور، ومايكل سينغ منتدى سياسي في معهد واشنطن. وباور هي زميلة “بلومنستين كاتس” في برنامج مكافحة الإرهاب في المعهد، ومستشارة سياسية بارزة سابقة لشؤون إيران في “مكتب تمويل الإرهاب والجرائم المالية” التابع لـ “وزارة المالية” الأمريكية. وكلاوسون هو زميل أقدم في زمالة “مورنينغستار” ومدير الأبحاث في المعهد، ومؤلف الدراسة التي صدرت مؤخراً باللغة الانكليزية بعنوان، “القضايا التكتيكية المحيطة بالانسحاب الأمريكي من الاتفاق النووي مع إيران“. وسينغ هو زميل أقدم في زمالة “لين- سويغ” والمدير الإداري في المعهد، وقد شغل منصب مدير أقدم لشؤون الشرق الأوسط في “مجلس الأمن القومي” الأمريكي في الفترة 2005 – 2008. وفيما يلي ملخص المقررة لملاحظاتهم”. في إيران، كما في بلدان أخرى، غالباً ما تكون السياسة محلية. وعلى الرغم من عناوين الأخبار، لا يركّز الشعب الإيراني ولا النخب السياسية على «خطة العمل الشاملة المشتركة»، المعروفة بالاتفاق النووي، الذي قررت إدارة ترامب الانسحاب منه مؤخراً. وبالنسبة إلى النخب، تنطوي القضية الجوهرية على تحديد مَن سيخلف المرشد الأعلى الحالي، آية الله علي خامنئي، أو أي كيان سيقوم بذلك. وفي الواقع، عند وفاة خامنئي، سيصبح النظام عرضة للمعاناة. ويرجع ذلك جزئياً إلى أن خامنئي لم يسمح ببروز أي خليفة له. وفي الواقع، سيكون «الحرس الثوري الإسلامي» الإيراني المستفيد المحتمل، مما قد يقود الجمهورية الإسلامية نحو توجه أكثر عسكرياً وعلمانياً، على غرار النماذج القديمة التي وضعتها سوريا البعثية، والعراق البعثي، ومصر الناصرية. وبذلك يمكنها أن تنتقل من نظام سياسي أيديولوجي إلى نظام عسكري فاسد يدّعي التمسّك بالتزاماته الثورية – ويقوم بممارسة الاعتداءات في الخارج لتبرير وجوده. ويشير المقال الافتتاحي الذي نُشر مؤخراً على نطاق واسع تحت عنوان “دفاعاً عن رئيس عسكري”، إلى التأييد الشعبي لهذا التغيير في نموذج القيادة، كما توحي الهتافات في ألعاب كرة القدم بقبول واسع لهذا المفهوم. لقد أصبح «الحرس الثوري الإسلامي» حالياً كياناً قوياً من خلال ممارسة قوته من دون كلل – وتحديداً توسيع نفوذ طهران في الشرق الأوسط. فسواء في العراق أو سوريا أو لبنان أو اليمن، بإمكان إيران أن تشير إلى سياسة النشاط الإقليمي باعتبارها أعظم نجاح لها منذ الثورة عام 1979. ومن مزايا نموذج «الحرس الثوري»، تكلفته المنخفضة نسبياً، لا سيّما عند مقارنته بالنموذج الأمريكي في مساعدة الحلفاء. ففي العراق، يغطّي «الحرس الثوري» تكاليف وجوده من خلال الكسب غير المشروع وأنشطة أخرى تحقق له الكسب المادي. وبناءً على ذلك، لن تؤدي العقوبات المفروضة على سوق النفط الإيراني إلى جعل طهران “تجثوا على ركبتيها” [تنحني طوعاً]. وعلى الرغم من أن العقوبات ستقلّص بالتأكيد الصادرات الإيرانية، إلا أنّ الارتفاع المحتمل في أسعار النفط سيكون له أثر تعويضي، وقد يترك الإيرادات على ما كانت عليه قبل العقوبات. ومع ذلك، فبصورة عامة، لا يزال الاقتصاد الإيراني ضعيفاً. ومع استمرار هبوط الريال (“التومان”) الإيراني، وتحمل الإيرانيين العاديين العبء الأكبر، تَحوّل الاهتمام الشعبي إلى مشاكل البلاد المالية ومصادرها. ومن جهته، سعى «الحرس الثوري» إلى تحويل أي تركيز عن الفساد والمحسوبية المستشريَيْن، وهي اتهامات ردّدها أفراد معتدلون مثل الرئيس حسن روحاني. إلا أن إشراف روحاني نفسه على الاقتصاد، منذ أن أصبح رئيساً عام 2013، كان فاشلاً ولم يتمكن من الوفاء بوعوده. فبدلاً من أن تسهّل «خطة العمل الشاملة المشتركة» تحقيق مكاسب مالية، أدّى الفساد المحلي والتخبّط البيروقراطي إلى إحباط آمال النمو المالي والاستثمار الأجنبي. بالإضافة إلى ذلك، أضعفت الأزمة المصرفية المحلية الحالية ثقة الإيرانيين في قدرة قادتهم على إصلاح الضرر الاقتصادي. على الرغم من أن «خطة العمل الشاملة المشتركة» لم تكن تذكرة ذهبية، إلا أنها منحت إيران فرصة للاندماج مجدداً في الاقتصاد العالمي. وعلى وجه التحديد، مكّنت إيران من الدخول مجدداً إلى سوق الطاقة وسمحت لها بالقيام بأعمال تجارية مع كيانات أجنبية ومؤسسات مالية تنخرط في “معاملات كبيرة” مع الكيانات الإيرانية المصنّفة – والعكس بالعكس. وفي الواقع، فمن منظور العقوبات، يشير الانسحاب الأمريكي من «خطة العمل الشاملة المشتركة» إلى العودة إلى النظام الذي كان قائماً قبل التوقيع على الاتفاق النووي، وهو: حظر اقتصادي على الجمهورية الإسلامية. وستعود بعض العقوبات إلى حيز التنفيذ بعد تسعين يوماً، ولكن بعد 180 يوماً، ستُفعّل جميع حالات الحظر التي تم رفعها وفقاً لـ «خطة العمل الشاملة المشتركة»، ويشمل ذلك الحظر على الطاقة (النفط والغاز)، وقطاع الشحن البحري، و”البنك المركزي الإيراني”. وفي الوقت نفسه، سيتم مجدداً فرض عقوبات على نحو أربعمائة شخص وكيان إيراني. وفي حين تتمتع الإدارة الأمريكية بقدر وافر من حرية التصرف، إلا أنها تواجه حالياً معضلة حول كيفية تنفيذ أحكام هذه العقوبات الرئيسية، خاصة فيما يتعلق بتفسير ما يعتبر “صفقة هامة” وشروط “تخفيض الإعفاءات بشكل كبير”. وفي نهاية المطاف، سيتعيّن اتخاذ قرار سياسي بشأن درجة الإنفاذ. وقد أعرب الرئيس ترامب أنه يريد ممارسة “أقصى قدر ممكن من الضغط” على النظام الإيراني، ولكن قد يكون من المنطقي تأخير التنفيذ أو إلغائه – أو ترخيص بعض الأنشطة. ومن شأن ذلك أن يبدي حسن النية السياسية مع نظرائه الأوروبيين ويتجنب الدمار الدبلوماسي، لا سيّما عندما لا يكون للتنفيذ القوي أثر ملحوظ على أهداف السياسات العامة. وستتطلع الحكومات الأوروبية إلى التقليل من تداعيات الانسحاب الأمريكي من «خطة العمل الشاملة المشتركة»، سواء بالنسبة لشركاتها الخاصة أو للحفاظ على المنافع لإيران. ولكن ليس أمامها سوى خيارات واضحة قليلة للقيام بذلك. على سبيل المثال، كانت التوجيهات الصادرة عن “مكتب مراقبة الأصول الأجنبية” واضحة، وهي أنه لن يتم العمل بالعقود التي وقّعت قبل إعادة فرض العقوبات، لأن ممارسة الأعمال التجارية بعملة غير أمريكية سيبقى معرضاً للعقوبات الأمريكية. بالإضافة إلى ذلك، فإن العقوبة التي تخاطر بها المؤسسات المالية هي ليست مجرد غرامة مالية، بل من المحتمل فقدان إمكانية الوصول إلى النظام المالي الأمريكي والدولار الأمريكي. وبالتالي، يجب على الحكومة الأمريكية أن تسعى أولاً إلى توفير أقصى قدر من الوضوح في إعادة فرض هذه العقوبات. وفي حين قد يجادل البعض بأن ترك القوانين غامضة قد يجبر شركات معينة على “عدم المخاطرة” من خلال الانسحاب الكامل من السوق الإيرانية، إلّا أنّ هذا الاتجاه سيقوّض جهود الولايات المتحدة الرامية إلى جعل حلفائها يتفقون معها على هذا الأمر. بالإضافة إلى ذلك، يمكن أن يهدد ذلك قيام ردود فعل دولية تهدف إلى تجنّب التعامل كلياً مع النظام المالي الأمريكي، مما قد يجعل العقوبات الأمريكية أقل فاعلية عموماً على المدى البعيد. وعلى هذا النحو، يجب على وزارة المالية الأمريكية أن تؤكد أيضاً على أن هذه المحظورات لا تهدف إلى معاقبة القطاع الخاص، وأن التعاون ضروري لتحقيق أهداف السياسة الأمريكية. وأخيراً، سيكون من المهم إدراج أساس سردي واضح للعقوبات الجديدة. وخير مثال على ذلك التصنيف الأخير لشبكة تبادل عملات قامت بشراء مبالغ نقدية كبيرة بالدولار الأمريكي بشكل مخادع لصالح «قوة القدس» التابعة لـ «فيلق الحرس الثوري الإسلامي» لتمويل وكلائها الإقليميين. وكان هذا النهج القائم على الأدلة، والمرجح أن يبقى كذلك، أفضل فرصة للعمل المنسّق المتعدد الجهات. أثرت ثلاثة عوامل أساسية على انسحاب الرئيس الأمريكي من «خطة العمل الشاملة المشتركة». ويتعلق العامل الأول بنقد جوهر الاتفاق نفسه، بدلاً من القلق بشأن امتثال إيران [لالتزاماتها بموجب اتفاقات الضمانات لمعاهدة عدم انتشار الأسلحة النووية]. وعلى وجه التحديد، شعر مسؤولون في الحكومة الأمريكية بالقلق لأن الاتفاق النووي لم يفعل الكثير لمنع السلوك العدائي الإيراني، مثل تطوير قدرات الأسلحة النووية، لفترة قصيرة جداً. وفي المقابل، رأوا أن التخفيف من العقوبات الذي مُنح [لإيران] من خلال «خطة العمل الشاملة المشتركة» هو أمر واسع جداً ويستمر وقتاً طويلاً. بالإضافة إلى ذلك، حدّ الاتفاق من خيارات السياسة الأمريكية المتاحة للتعامل مع سلوك إيران المتعلق بتطوير كل من الصواريخ البالستية ودعم القوى المعادية للمصالح الأمريكية في جميع أنحاء المنطقة. ثانياً، شعرت الإدارة الأمريكية بالضعف الاقتصادي والسياسي الذي يسود النظام الإيراني في الوقت الراهن. أمّا العامل الثالث فيتعلق بالإعلان عن استئناف المحادثات مع كوريا الشمالية، والذي حدث قبل أربعة أيام من حلول موعد تجديد فترة الإعفاءات. وتمهيداً للمفاوضات المحتملة مع جمهورية كوريا الديمقراطية الشعبية، كانت الإدارة الأمريكية تسعى إلى تكوين وجهة نظر مفادها أن الولايات المتحدة لن ترضى بأي اتفاق. وهنا، ربما كان يدور بخلد الإدارة الأمريكية الرغبة في تكرار النموذج الكوري الشمالي مع إيران، وهو ممارسة “أقصى قدر ممكن من الضغط” مقترناً بالرغبة في الدخول في مفاوضات واسعة النطاق.و في الواقع، يتنافس القرار بشأن إيران مع كوريا الشمالية، ومع التعريفات على الفولاذ والألمنيوم، والعديد من أولويات السياسة الخارجية الأخرى في واشنطن. وفي الحملات السابقة لفرض عقوبات على إيران، كانت الإدارات الأمريكية قد اتبعت قدراً هائلاً من الدبلوماسية لضمان تنفيذ آليات الرقابة القائمة على أسواق رأس المال في إطار متعدد الأطراف والالتزام بها. ففي عام 2006، على سبيل المثال، تبنّت الولايات المتحدة سلسلة من قرارات مجلس الأمن الدولي التي وضعت الأساس الدبلوماسي للتنسيق مع الاتحاد الأوروبي إلى جانب روسيا والصين. وستكون هذه المرة الأولى التي تسعى فيها واشنطن إلى فرض هذا النوع من العقوبات في ظل هذا الاختلاف الاستراتيجي الحاد مع حلفائها الدبلوماسيين. وسيركز الأوروبيون على وجه الخصوص على تهدئة طهران والإبقاء على الاتفاق معها، وبالتالي إعطاء إيران نفوذ للتفاوض على اتفاق أفضل مع الأطراف الموقعة المتبقية. ومن الآن فصاعداً، يجب على الولايات المتحدة أن تحاول إصلاح بعض الخلافات بينها وبين حلفائها الأوروبيين من خلال استمرار المحادثات مع بريطانيا وفرنسا وألمانيا (“مجموعة الدول الأوروبية الثلاث”) على وجه التحديد والجهات الفاعلة الأخرى – حتى وإن نتج عن ذلك تقديم بعض التنازلات بشأن العقوبات. ينبغي على واشنطن أيضاً أن تحدد الانسحاب من «خطة العمل الشاملة المشتركة» في سياق استراتيجية ذات نطاق أوسع تجاه إيران. ومن شأن اتباع نهج شامل، إلى جانب الدعم المقدم من “مجموعة الدول الأوروبية الثلاث”، أن يسمح بنوع من التنسيق الذي تحتاجه واشنطن لممارسة أقصى درجات الضغط على الجمهورية الإسلامية. أعدت هذا الموجز إيريكا نايجيلي. This is a deletion center, one of Facebook’s largest, with more than 1,200 content moderators. They are cleaning up content — from terrorist propaganda to Nazi symbols to child abuse — that violates the law or the company’s community standards. Around the world, Facebook and other social networking platforms are facing a backlash over their failures to safeguard privacy, disinformation campaigns and the digital reach of hate groups. In India, seven people were beaten to death after a false viral message on the Facebook subsidiary WhatsApp. In Myanmar, violence against the Rohingya minority was fueled, in part, by misinformation spread on Facebook. In the United States, Congress called Mark Zuckerberg, Facebook’s chief executive, to testify about the company’s inability to protect its users’ privacy. As the world confronts these rising forces, Europe, and Germany in particular, have emerged as the de facto regulators of the industry, exerting influence beyond their own borders. Berlin’s digital crackdown on hate speech, which took effect on Jan. 1, is being closely watched by other countries. And German officials are playing a major role behind one of Europe’s most aggressive moves to rein in technology companies, strict data privacy rules that take effect across the European Union on May 25 and are prompting global changes. Gerd Billen, the secretary of state for Germany’s Ministry of Justice and Consumer Protection, says that data protection is a fundamental right. Germany’s troubled history has placed it on the front line of a modern tug-of-war between democracies and digital platforms. But banned posts, pictures and videos have routinely lingered on Facebook and other social media platforms. Now companies that systematically fail to remove “obviously illegal” content within 24 hours face fines of up to 50 million euros. Some decisions to delete are easy. Posts about Holocaust denial and genocidal rants against particular groups like refugees are obvious ones for taking down. Complicated cases have raised concerns that the threat of the new rules’ steep fines and 24-hour window for making decisions encourage “over-blocking” by companies, a sort of defensive censorship of content that is not actually illegal. The far-right Alternative of Germany, a noisy and prolific user of social media, has been quick to proclaim “the end of free speech.” Human rights organizations have warned that the legislation was inspiring authoritarian governments to copy it. Other people argue that the law simply gives a private company too much authority to decide what constitutes illegal hate speech in a democracy, an argument that Facebook, which favored voluntary guidelines, made against the law. German officials counter that social media platforms are the arbiters anyway. Nils has seen it all. Child torture. Mutilations. Suicides. Even murder: He once saw a video of a man cutting a heart out of a living human being. And then there is hate. The issue is deeply personal for Nils. He has a 4-year-old daughter. “I’m also doing this for her,” he said. The center here is run by Arvato, a German service provider owned by the conglomerate Bertelsmann. The agents have a broad purview, reviewing content from a half-dozen countries. Those with a focus on Germany must know Facebook’s community standards and, as of January, the basics of German hate speech and defamation law. “Two agents looking at the same post should come up with the same decision,” says Karsten König, who manages Arvato’s partnership with Facebook. The Berlin center opened with 200 employees in 2015, as Germany was opening its doors to hundreds of thousands of migrants. Anas Modamani, a Syrian refugee, with Chancellor Angela Merkel of Germany in Berlin in September 2015. Anas Modamani, a Syrian refugee, posed with Chancellor Angela Merkel and posted the image on Facebook. It instantly became a symbol of her decision to allowing in hundreds of thousands of migrants. Soon it also became a symbol of the backlash. The image showed up in false reports linking Mr. Modamani to terrorist attacks in Brussels and on a Christmas market in Berlin. He sought an injunction against Facebook to stop such posts from being shared but eventually lost. The arrival of nearly 1.4 million migrants in Germany has tested the country’s resolve to keep a tight lid on hate speech. The law on illegal speech was long-established but enforcement in the digital realm was scattershot before the new legislation. Posts calling refugees rapists, Neanderthals and scum survived for weeks, according to jugendschutz.net, a publicly funded internet safety organization. Many were never taken down. Researchers at jugendschutz.net reported a tripling in observed hate speech in the second half of 2015. But the problem did not go away. Over the 15 months that followed, independent researchers, hired by the government, twice posed as ordinary users and flagged illegal hate speech. During the tests, they found that Facebook had deleted 46 percent and 39 percent. “They knew that they were a platform for criminal behavior and for calls to commit criminal acts, but they presented themselves to us as a wolf in sheep skin,” said Mr. Billen, a poker-faced civil servant with stern black frames on his glasses. By March 2017, the German government had lost patience and started drafting legislation. The Network Enforcement Law was born, setting out 21 types of content that are “manifestly illegal” and requiring social media platforms to act quickly. Officials say early indications suggest the rules have served their purpose. Facebook’s performance on removing illegal hate speech in Germany rose to 100 percent over the past year, according to the latest spot check of the European Union. Platforms must publish biannual reports on their efforts. The first is expected in July. At Facebook’s Berlin offices, Mr. Allan acknowledged that under the earlier voluntary agreement, the company had not acted decisively enough at first. He cited another independent report for the European Commission from last summer that showed Facebook was by then removing 80 percent of hate speech posts in Germany. The reason for the improvement was not German legislation, he said, but a voluntary code of conduct with the European Union. Facebook’s results have improved in all European countries, not just in Germany, Mr. Allan said. “There was no need for legislation,” he said. “They could have prevented the law,” he said. YouTube scored 90 percent in last year’s monitoring exercise. If other platforms had done the same, there would be no law today, he said. Germany’s hard-line approach to hate speech and data privacy once made it an outlier in Europe. The country’s stance is now more mainstream, an evolution seen in the justice commissioner in Brussels. Vera Jourova, the European Union’s justice commissioner, deleted her Facebook account in 2015 because she could no longer stand the hate. Vera Jourova, the justice commissioner, deleted her Facebook account in 2015 because she could not stand the hate anymore. But Ms. Jourova, who grew up behind the Iron Curtain in what is now the Czech Republic, had long been skeptical about governments legislating any aspect of free speech, including hate speech. Her father lost his job after making a disparaging comment about the Soviet invasion in 1968, barring her from going to university until she married and took her husband’s name. When Germany started considering a law, she instead preferred a voluntary code of conduct. In 2016, platforms like Facebook promised European users easy reporting tools and committed to removing most illegal posts brought to their attention within 24 hours. The approach worked well enough, Ms. Jourova said. It was also the quickest way to act because the 28 member states in the European Union differed so much about whether and how to legislate. But the stance of many governments toward Facebook has hardened since it emerged that the consulting firm Cambridge Analytica had harvested the personal data of up to 87 million users. Representatives of the European Parliament have asked Mr. Zuckerberg to come to Brussels to “clarify issues related to the use of personal data” and he has agreed to come as soon as next week. Ms. Jourova, whose job is to protect the data of over 500 million Europeans, has hardened her stance as well. Lt. Col. Jonathan Conricus, the international spokesman and head of social media for the Israel Defense Forces, made the comments during a Jewish community briefing organized by the Jewish Federations of North America (JFNA). The officer fiercely defended the military’s response to the recent protests along the Gaza border, in which more than 100 Palestinians were killed and thousands more wounded, most of them by live fire. Many commentators have said Hamas won a PR victory following the worldwide media coverage given to the bloody scenes, especially following Monday’s juxtaposition of scenes on the Gaza border and the opening of the U.S. Embassy in Jerusalem. Conricus said Israel hasn’t been able to explain the situation on the border well enough to the international media. Conricus acknowledged that the IDF had failed to minimize the number of casualties. However, he noted that “Hamas wanted the casualties. Hamas wanted people to die. Hamas wanted the pictures of the wounded and the overflowing hospitals … and they had no problems sending the human shields forward. That is the sad reality of what we have been facing,” he said. 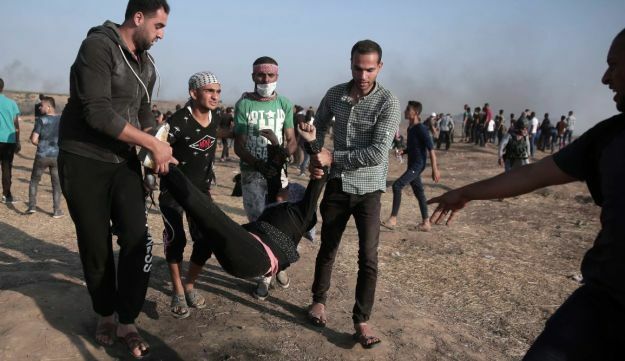 While blaming Hamas for sending “rioters” to the border area and using civilians as human shields, Conricus also conceded that the army snipers didn’t always hit their intended targets. On the border, he said, the army deploys “combat soldiers, devoted, [who] understand what they are defending,” and are not “trigger-happy, undisciplined.” The soldiers “take orders from their superior officers” and are “executing their missions with discipline, with professionalism and using their weapons proportionately and as they are intented according to the rules of engagement,” Conricus said. Conricus said Israel could not afford to let the risk of letting the protesters break through the fence, for fear they might attack kibbutzim and communities that are mere hundreds of meters from the border. “When the dilemma came to, on one hand, defending the Israeli border and Israeli communities immediately behind the border, or allowing the rioters through and having a lower amount of Palestinian casualties, there’s no dilemma,” Conricus said. Conricus also said a number of IDF investigations into events on the Gaza border were opened in the past few weeks. “We have a fact-finding mission … with full authority to investigate and question and to flag events that the commander of that team thinks are problematic. And they also have the authority to recommend criminal investigations against Israeli officers and soldiers,” he explained. “That mechanism has been in place for more than four weeks. It has investigated a few events,” he added. 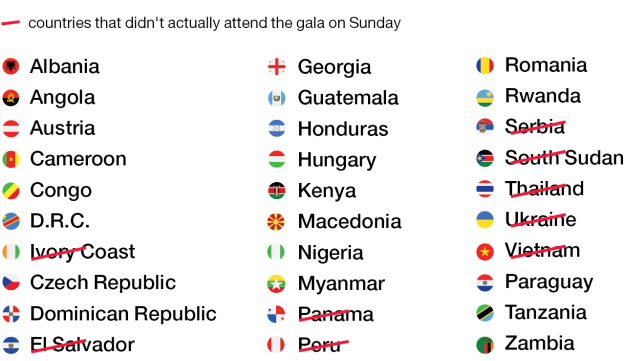 After an initial attendance list was published in Haaretz, several countries – including Serbia, Vietnam, Peru, El Salvador and the Ivory Coast – denied they had confirmed their attendance and said they weren’t planning to come. Twenty-two foreign envoys attended the Foreign Ministry receptionon Sunday in honor of the U.S. Embassy’s move to Jerusalem the following day, according to the final list of participants submitted to Haaretz at its request. Before the event, the ministry had said 32 foreign representatives had confirmed they would attend, of the 86 who were invited. Besides the four representatives from Austria, Hungary, Romania and the Czech Republic, which bucked the European Union’s stanceagainst the U.S. Embassy move, ambassadors or other representatives attended from the following countries: Guatemala, Paraguay, Honduras, Bosnia and Herzegovina, Georgia, Macedonia , Myanmar, Angola, Cameroon, Democratic Republic of Congo, Republic of the Congo, Dominican Republic, Ethiopia, Kenya, Nigeria, Rwanda, Zambia and Tanzania. The other EU nations boycotted the reception. The earlier list of the countries confirming attendance at the Foreign Ministry reception had included Albania, Ivory Coast, El Salvador, Panama, Peru, the Philippines, Serbia, South Sudan, Thailand, Ukraine and Vietnam. After the earlier list was published in Haaretz, several of these countries – Serbia, Vietnam, Peru, El Salvador and the Ivory Coast – denied they had confirmed their attendance and said they weren’t planning to come. Bulgaria was also first mentioned as a European planning to attend, but its local representatives denied this. Bosnia had not appeared in the previous list.